Syd Fischer’s TP52 Ragamuffin took first place in the IRC Division, winning the Janzoon Trophy, closely followed by Stephen Ainsworth’s RP63 Loki with Bob Steel’s TP52 Quest in third. The fleet of 25 yachts started racing at 1900hrs in 20-25knots of N/NW breeze and once offshore experienced strong NE winds heading to Bird Island. After a terrible start, Stephen Ainsworth’s RP63 Loki recovered to make it out of the heads first. Peter Millard and John Honan’s 98ft maxi Lahana had a conservative start but made up ground throughout the race to eventually take the line honours win. “It was on the nose all the way up to Bird Island, rather than making one good tack and sailing away. We lost the lead to Lahana and spent most of the race trying to run her down. Once we rounded the island, it was a fast ride home with the boat never under 20 knots. It was a great way to finish a race!,” concluded Ainsworth. Loki finished second across the line, just 10 minutes behind Lahana in a race time of 9hrs, 48 mins and 50 seconds. 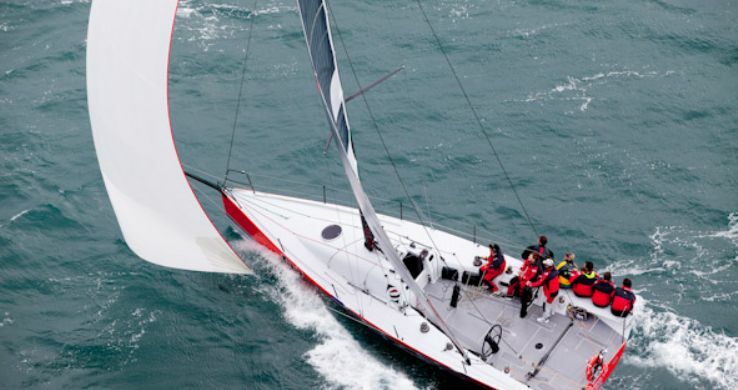 Michael Hiatt’s Farr 55 Living Doll was forced to retire from the race on Saturday morning after the boat sustained rudder damage just 4 nautical miles off Sydney Heads. “I’m glad this happened now and not on the way to Hobart. We’ll ship the rudder to New Zealand to have it repaired and we’ll be back for the Flinders Island Race. Up until we sustained the damage, I was happy with the boat’s performance and was achieving my goal of trying to get the most out of the boat and its handling ability offshore,” concluded Hiatt. John Cameron’s Dibley 46 More Witchcraft retired prior to the start of the race due to engine problems and Andrew Wenham’s Peterson 44 SES Inch by Winch was forced to retire from the race with a broken shroud. Roger Hickman’s Farr 43 Wild Rose took first place in the PHS Division winning the George Barton Trophy. David Beak’s Beneteau First 44.7 Mr Beaks Ribs finished second with Ed Psaltis and Bob Thomas’ modified Farr 40 AFR Midnight Rambler third. Ed Psaltis and Bob Thomas’ modified Farr 40 AFR Midnight Rambler still leads the Blue Water Pointscore despite another tough race that brought back memories of the Audi Sydney Gold Coast Yacht Race in July. The gamble to stay inshore or go offshore to pick up additional breeze was a tough decision, with AFR Midnight Rambler taking the offshore option but not going out too far. “We got hit by the dust storm east of Cape Three Point and the breeze shifted to W/SW as we approached Barranjoey. This meant that for the last 14 miles of the race, the breeze was on the nose again,” concluded Psaltis.